The First Lady Michelle Obama writing a book on healty food ! 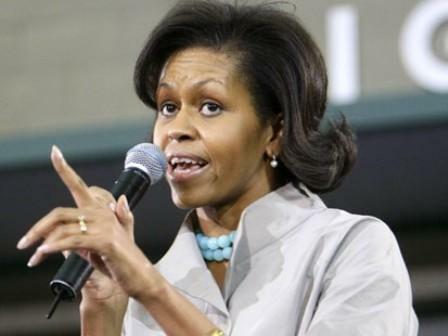 Michelle Obama decided to practice a talent of hers, so she started to write a book. It’s a pleasant surprise that the first lady becomes a writer, even tough the subject of the book is not very profound. She will write about a garden on the South Lawn of the White House which is her leisure job and also about the importance and benefits of healthy food. The book will be published by the Crown Publishing Group (with whom Obama’s wife already singed a contract), and it has no title yet. But there is time for that considering that it’s scheduled to appear somewhere in April 2012. Michelle Obama stated that she has no interest in financial earnings after publication, and she will donate all the money to some charities. The book will be like a guide for a healthy living, an inspiration to make lifestyle changes and it will “provide ideas and resources for readers to get involved in the movement to create community, school and urban gardens, support local farmers’ markets” said the Crown Publishing. The content of the book will also include some personal recipes, that Michelle Obama often uses in her kitchen. With this book, the first lady follows a tradition at the White House. Before her, Hillary Clinton and Laura Bush also wrote a book.